It’s the time of year when my hands get so dry and cracked that my fingers snag things and I fear inflicting a gaping wound on myself with one haphazard itch of my face. Winter weather equals dry air, dry air leads to dry skin, and no amount of molesting my home humidifier helps prevent bloody knuckles and fingers that rival those of a prize-winning boxer. I admit that I don’t do everything I can to prevent this, as you’ll see below, but I am really trying to remember that typing with Band-Aids on my fingers does nothing more than create a new language that even I can’t understand. But for those with less of a self-sadistic nature than I apparently have, let’s examine our options. Apply lotion early and often. This is obvious and something I do year round to just about every square inch of my body, sometimes because it’s needed and sometimes because it smells pretty. But in the fall/winter, my skin soaks it up like a sponge and I have lotion on my desk, in my purse, etc. The problem is that my brain often runs out of order, and so the cycle goes something like this: Put on lotion, get distracted and go do something else that necessitates washing my hands (basically everything, which I know is part of the problem) or getting them wet, realize what I’ve done and make a mental note of mistake, reapply lotion, forget mental note 1.3 seconds later and repeat the cycle again. In other words, I go through more bottles of lotion than a horny teenage boy. Learn from my mistakes people—or buy stock in Jergens. Limit your time in the shower and use only warm—not hot—water. It’s been my experience that showers are a great place to spend 4 minutes thinking about all of my problems and 1 minute actually showering. I also read the shampoo bottles out loud in the multiple languages —“Shampoo/shampooing” “cranberry oil/huile de canneberge”—and compose great literary works in my head. I think it’s something about the steam releasing all the creative things from my brain or something. Look it up. It’s probably a thing. Anyway, while I try and limit my time in the shower—and my water bill—I do enjoy these moments of self-proclaimed genius before they’re sucked down the drain with the suds. Plus, it’s nice and warm in there, so I (incorrectly) figure extra lotion will make up for the five minutes of warm misty love. This is a great option in theory. In fact, I’ve even gone so far as to purchase thick yellow gloves from the store and keep them next to the sink. However, much like putting the vacuum in the middle of the floor and then walking around it for a good day or two before using it, availability does not guarantee usage. The sad thing is the damn gloves are right next to the sponge that I use, yet I still don’t put them on every time, as if the effort required was comparable to putting on a NASA space suit. But when I do put them on, I sometimes forget that I’m wearing them and dry my still-gloved hands with the towel because I’m a genius. So to summarize, do as I say and not as I do and you might make it through winter okay. And for that, I shall give you a (moisturized) hand–and then promptly go wash mine again. This entry was posted in Uncategorized and tagged dry hands, how to prevent dry hands, lotion, natalie dee, showering, washing dishes, washing my hands, winter. Bookmark the permalink. I have the same problem, and the amount of hand washing that accompanies potty training is NOT helping. I always fall into that lotion, wash hands, re-lotion, forget, wash hands cycle too. I have used gloves one time ever to wash dishes and I’m constantly getting burned. I’m going to print this out and hang it up next to my sink. I “dry my still-gloved hands with the towel because I’m a genius.” HaHa. That’s awesome. Good ideas in the shower? Totally a thing. So basically, being in the shower makes your writing better, but makes all your skin bleed. Oopsies. I have to admit… Kitchen gloves kinda freak me out. I buy them thinking that they’re a great idea, and then when I put them on and try to use them I get freaked out that I can feel the running water but I’m not getting wet…. Abby I’m convinced that all of the lotion manufacturers put an ingredient (one of those chemicals with an unpronounceable name) into their concoctions that actually makes your skin dry up and crack over time. All so you will buy MORE lotion! I’m having the same problems. But most of my problem is that my dry skin gets really itchy and I hate lotion. My mom keeps giving me odd looks while I sit there scratching myself. Love this! I’m a lotion freak! I just dedicated an entire blog post last week to my dry, cracked, angry fingers. Riveting, I know. I share this because a friend then informed me that you can buy finger glue specifically for this problem. I had no idea! 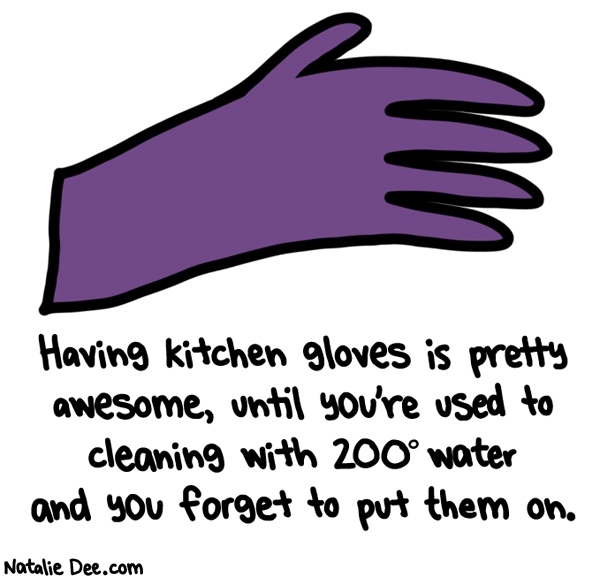 (also I am a kitchen glove convert – once you go gloves, you’ll never go back). Lotion never makes up for 5 minutes of warm misty love. I hate that all winter I look like I’ve been in a brawl. And lost. Stupid bloody, cracked knuckles. 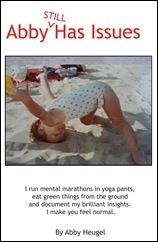 Laugh out loud worthy post. But oh, your poor hands. Lotion those hands, baby, lotion ’em. Heeheehee, wouldn’t a shower be much less interesting if you only showered. I reckon we could solve all the problems in the world if we only had enough time in the shower. Great post and very recognizable, go lotion-addicts! “as if the effort required was comparable to putting on a NASA space suit.” Haha! This time of year is so brutal on the skin! I’m trying everything – lotions, body butters, lip balms, coconut oil… And of course, drinking plenty of water! I adore winter. However, I despise being itchy. My hands don’t get dry, it’s my back. So basically, I spend all winter perfecting my Baloo impersonation. I use to have a lot of problems with dry hands and cracked fingers. I stopped using “Dawn Antibacterial Dishwashing Soap” and stopped drinking Public System Water (filled with chemicals), and drink only bottled water. This has helped me a LOT! Being the mother of a new baby and then also not being pregnant and able to reach the faucet again, I’ve really increased my hand washing and the outside temps have plummeted. This has lead to dragon-like hands. I’ve learned but can’t seem to remember to OPEN THE BATHROOM DOOR BEFORE I start slathering lotion all over my hands. The lotion consumption in my home would put a horny teenager to shame as well. It’s the washing. I need to stop washing my hands and yet I can’t. They get dirty, I need to cook, clean, does it really matter. I wash them an obscene amount of times in any given day and now they are dry and deathly looking. Someone recommended lathering up in vasoline and then putting on gloves before bed each night, but I just know somehow the gloves will go missing and my sheets will be covered in greasy vasoline, again putting the teenage boy to shame and b) requiring more washing. It’s a brutal cycle. OMG! The same things happens to me. As soon as I apply lotion to my hands, I suddenly find myself doing something that requires I wash my hands and then I have to reapply the lotion all over again.